This report has been prepared exclusively for the MGM Grand Hotel, Inc. for Mr. Richard Faircloth and various attorneys working for MGM in regards to the development of proprieteary programs, protocols, hardware and sofware algorithms designed by Bitstream Technologies, Inc. under contract to MGM Grand Hotel, inc. Scope: The intent of this report is to help determine the date upon which MGM Grand's slot accounting system was capable of printing, reading, accepting and re-distributing cashless tickets by means of imprinting a bar code onto such tickets. On our about March of 1992 Applied Computer Technology began evaluating software that was developed for Five Star Solutions and subsequently sold to MGM Grand Hotels, Inc. for a slot monitoring and accounting system. We began to modify software and specify a new hardware platform for MGM to use in order to implement it's designed system and to allow expansion of it's current capabilites at the time. On June 30, 1992, Applied Computer Technology, Inc. issued a quotation to MGM Grand, Inc. to engineer and design a Universal Interface Board or UIB for MGM Grand to be installed into slot machines for the purpose of monitoring critical machine status and components, displaying messages to the user of the slot machine, reading magnetic strip cards and communicating messages to and from a host mainframe computer. 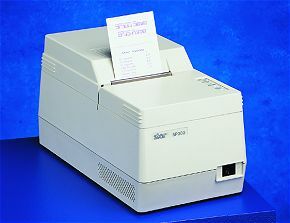 On or about July of 1992 the quotation was expanded to include the printing of Bar Codes on a receipt ticket printer manufacturered by Star Micronics Inc, model #sp300. MGM Grand provided us with a model printing algorithm in BASIC source code as an example of how to print the ticket which we used to develop our algorithm. This saved a lot of development time since the code they gave us already had been developed. We were also presented at that time with a sample ticket. On or about August of 1992, we received word from MGM that they had located a bill validator that was capable of reading the tickets that we were currently printing, and for us to start writing preliminary code for the validation of tickets to and from the mainframe computer so that when the unit did arrive we would be ready in a short time to test our protocols. On or about October 22 of 1992 we received a protoype Bill Validator from MGM Grand hotel who had received it from Pat Green of Triad Design having an address of 914 Main Street, Acton, MA 01720 at that time. The Bill Validator was special in that it not only was able to validate currency but also to validate coupons with bar coded tickets on them. 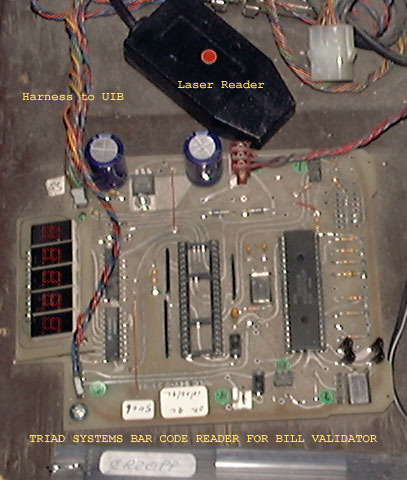 Mr. Green was using a second parties Bill Validator outfitted with his own special circuitry which incorporated a laser bar code reading system. I believe the second party was Coin Bill Validator. Research: A common practice of ours is to always include a commented modification history at the top of our programs with dates and modifications so that we may refer to them in the future to see what changes have occured. The following in an excerpt of the very first functioning version of code. Rev 1.01  5/20/92 Fixed do_sds_pend() incorrect indexing bug. that previous xmit ended before new one begins. new one that doesn't display cash amounts. As can be see by the above section of program highlighted in blue and titled Revision History, an entry was made on June 5, 1992 repairing a section of the program with the function name do_sds_pend(). This section upon further examination shows that the program at that time was capable of handling pending transactions for cashouts, and jackpots whereas the program would receive a cashout signal from the gaming device, transmit the amount of cashout or handpay to the mainframe computer, and await a command from the mainframe to print a ticket worth a set amount of credits/coins and finally signal the gaming machine after the ticket was printed that the pending state was complete and to continue it's operations as normal. A copy of this complete program is available for further examination by contacting Mr. Richard Faircloth at the MIS Department of MGM Grand Hotel, Inc. in Las Vegas, Nevada. 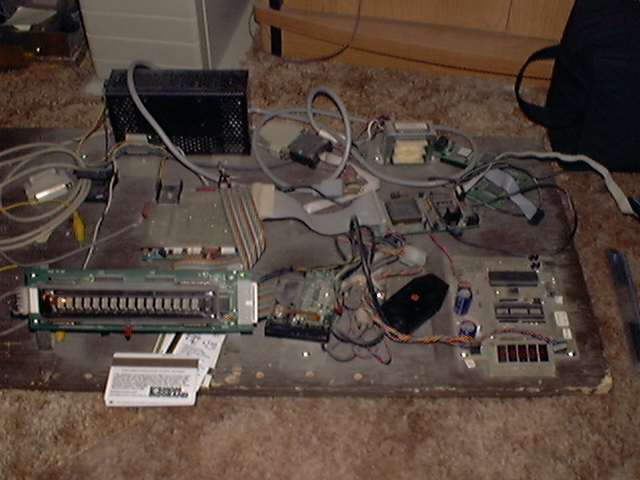 This is a photo of the original prototype unit showing the laser reader from Triad on the right, Display in front, Card reader to the right of the display and Universal Interface Board in the center. The printer was not around for this shot since we gave it back to MGM when our development was finalized.